Fighting for equal rights and justice is the only career John Taylor ever considered. A native of Chapel Hill, North Carolina, he’s the product of a family and community that taught him early on that injustices occur every day in this world, great and small — but we are not powerless against these wrongs. We have the power to bring about justice if we stand up for our rights and the Rule of Law. In his legal practice, John strives to do just that by representing people who have been defrauded, discriminated against, oppressed, injured or killed by negligence and wrongdoing. He looks forward to the challenge of litigating against corporations and insurance companies who aim to manipulate an already stacked deck to avoid accountability for harming innocent people. 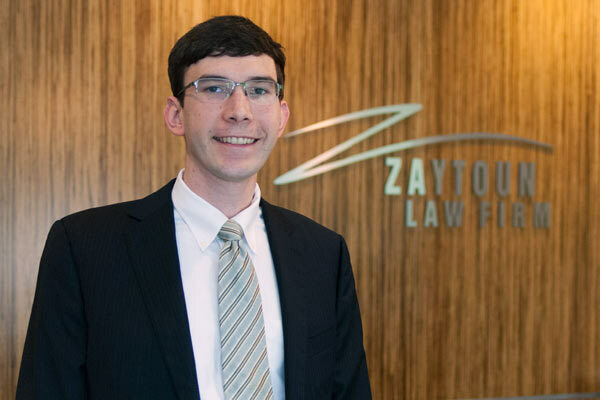 John has achieved great success in his young legal career by helping win many substantial verdicts and settlements for his clients at Zaytoun Law Firm. He was recognized by Super Lawyers in 2016, 2017 and 2018 as a “Rising Star” in medical malpractice litigation. He has also helped fellow lawyers learn and understand complex legal issues with his publications in the North Carolina Advocates for Justice magazine, Trial Briefs, and by teaching a continuing legal education class on the North Carolina Unfair and Deceptive Trade Practices Act. After graduating from Chapel Hill High School, John attended the University of Georgia, majoring in History and rooting on the “Dawgs” on Saturdays. He returned home to study law at the University of North Carolina at Chapel Hill, earning his JD in 2011. John spent his summers during law school as an intern at the Orange County Public Defender’s Office where he zealously represented accused clients in District Court. He also practiced in the UNC Civil Legal Assistance Clinic and took great joy in successfully advocating for underprivileged clients in landlord/tenant actions and unemployment matters. These practical experiences reinforced his calling to represent individual people as they navigate a confusing legal system — a labyrinth that too often favors governments and corporations at the expense of people’s rights. Before joining Zaytoun Law Firm in 2012, John worked as a law clerk to former Commissioner Chris Scott at the North Carolina Industrial Commission and drafted opinions for the Full Commission in workers’ compensation cases and claims against the State of North Carolina under the Tort Claims Act. John lives in Raleigh, North Carolina, with his beautiful wife Katie and son Luke. In his free time, he enjoys live music, sports, travel and spending time with family. Reducing Their Lien: Resolving Claims Under North Carolina’s New Medicaid Subrogation Statute, N.C. Gen. Stat. § 108A-57. NCAJ Trial Briefs Magazine, February 2015. Martin v. Moreau, et al, ___ N.C. App. ___, 770 S.E.2d 390 (2015). Member – North Carolina Advocates for Justice (Member, 2011- Present; Member of the Professional Negligence Section and Auto-Torts Section; Professional Negligence Section Membership Co-Chair; 2013-2017; NCAJ Membership Committee 2013-2017).